This sign hangs in the "Oceans" section at COSI in downtown Columbus. 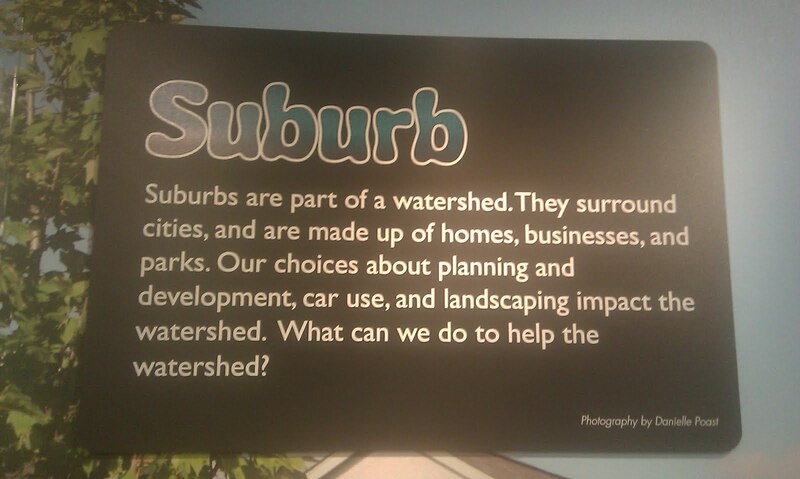 It's part of a room that explores watersheds and the impact of downtowns, suburbs, rural, and woodland areas on them. This is the "Suburb" sign that stands in front of a photo of a typical Columbus subdivision built in the last 25 years. Frankly, I thought it a little odd that the five unveilings for rural areas all involved feces of some kind or another. Is poop all some watershed thinkers think about when they get 50 miles outside of the downtown? Is there an urban bias being pushed on kids visiting this exhibit?